Sensitive skin can be tricky to deal with and for many, it can be a challenge to find effective, yet gentle skin care. Finding a good sunscreen that doesn’t negatively affect those with sensitive skin can also be a challenge. This season however, there are some great facial sunscreens available that are perfect for those with sensitive skin. Kiehls Super Fluid UV Mineral Defense SPF50+ ($47) – This lightweight facial sunscreen offers up advanced UVA/UVB technology and pollution protection. Its a 100% mineral-based sunscreen and a great choice for sensitive and acne-prone skin. Avene Mineral Light Hydrating Sunscreen Lotion SPF 50+ ($36) – Formulated for both the face and body, this ultra-light, water-resistant 100% mineral sunscreen offers broad-spectrum SPF 50+ UVA/UVB filters and powerful anti-oxidant protection. It’s made for even the most sensitive skin types and can be used by the whole family (ages 6 months and up). 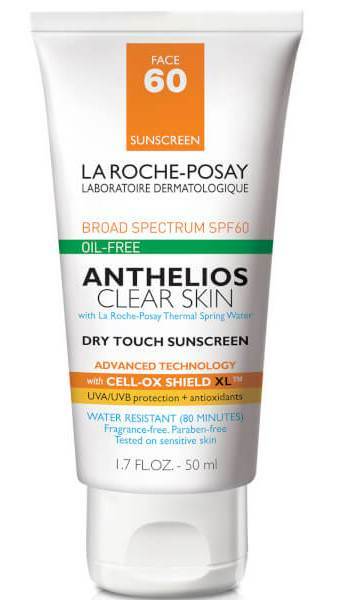 La Roche-Posay Anthelios Clear Skin Dry Touch Sunscreen SPF 60 ($19.99) – This popular, water-resistant sunscreen gives solid protection, absorbs pore-clogging oil (even in heat and humidity), and won’t cause breakouts. Neutrogena Sensitive Skin Sunscreen Lotion Broad-Spectrum SPF 60+ ($11.49) – Free of fragrance, this very popular oil-free sunscreen lotion for sensitive skin absorbs quickly and provides superior broad-spectrum UVA/UVB sun protection.